Aim: Our aim is to test whether species richness patterns are best explained by the effect of the total amount of habitat within the landscape, or instead by a combination of patch size and patch isolation effects. To this end, we jointly contrast the habitat amount hypothesis and countryside biogeography with patch size and isolation concepts from island biogeography. Location: Three multi-habitat landscapes in Peneda-Gerês National Park, NW Portugal. Taxon: Macro-moths (Lepidoptera). Methods: Light-trapping using a semi-nested design at 84 fixed sites which were each repeatedly sampled six times. Results: Autocovariate models show that sampling sites with a higher number of forest and meadow macro-moth species (alpha diversity) were surrounded by a higher amount of forest and meadow habitat, respectively within a 160 and 320 m radius (scale of effect). These top-ranked models, containing only habitat amount as a significant variable, had lower AIC than models (only) containing patch size and/or isolation. Complementary to this, the countryside species-area relationship (SAR) model outperforms the classic SAR model, so that the effective area of habitat explains landscape species richness (gamma diversity) across spatial scales (beta diversity) better than the classic SAR. Specifically, we show that forest macro-moths have a higher spatial turnover than meadow macro-moths and that, on average, there are more species in forest than in meadow habitat. Main conclusions: The habitat amount hypothesis predicts alpha species richness in multi-habitat landscapes better than do patch size and isolation while the countryside SAR predicts beta and gamma diversity better than the classic SAR. 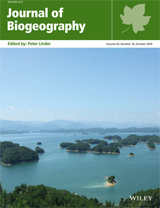 We suggest that evidence is mounting to revise the application of the classical approaches of island biogeography and metapopulation theory to conservation biogeography.